I feel like I’m a little late to board the pumpkin train. Everywhere I look lately, there’s pumpkin bars, pumpkin smoothie, pumpkin bread, and, of course, pumpkin spice lattes. Truth be told, I’ve never really been an OMG PUMPKIN person. Until this fall. Specifically, until this curry. I’ve been really craving all things salty and savory lately rather than sweet, so I didn’t want to make any kind of pumpkin dessert. I just made my first curry a few weeks ago and loved the creaminess and slightly spicy flavors. I also loved that there were so many options for the base of the curry: you could eat it plain, or with rice, cauliflower rice, quinoa, etc. So basically what happened is I whipped up a simple coconut curry with vegetables and threw in some pumpkin puree, and BOOM. This pumpkin coconut curry was born. …Then I also threw in some chickpeas because you know how much I love those little suckers. It’s super duper important, like absolutely necessary, to use pumpkin puree and NOT pumpkin pie filling. None of that sugary stuff here. I like to buy organic canned pumpkin puree, but Alexa from Fooduzzi has a great tutorial on how to make your own pumpkin puree, if you’re feeling really adventurous. Did you know just 1 cup of cooked pumpkin can give you waaaaay more than the daily recommendation for vitamin A? Which is especially important for good eyesight! So eat yo’ pumpkin and other orange veggies. You can throw this curry on any grains you like, or none if you prefer, but I went with buckwheat just ’cause I had some on hand. Buckwheat just happens to be gluten-free, so despite its name, it’s totally wheat free! 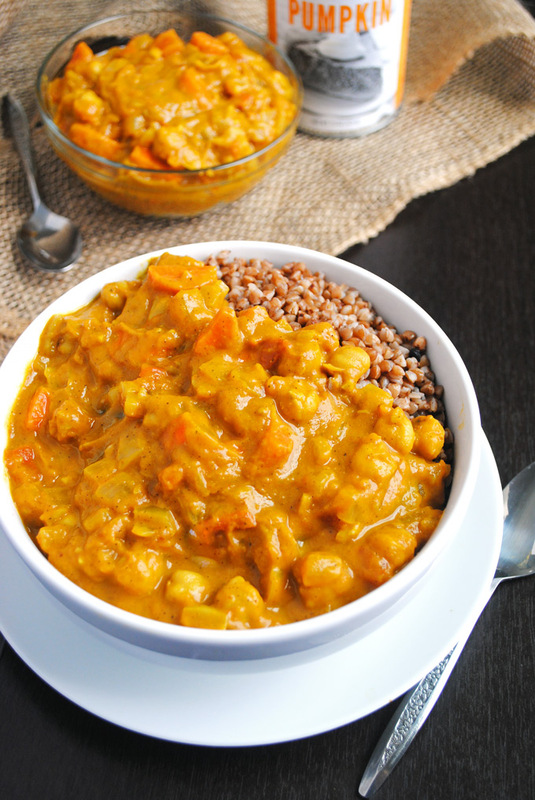 This curry would also be delicious over rice or quinoa. This easy Chickpea Pumpkin Coconut Curry is a delicious, comforting soup for fall and winter and will warm you up from the inside out! I have never made curry before, but this looks like a good place to start! We must be like pantry twins, because I have almost all of these ingredients again! Well except the coconut milk, I’ll have to pick that up next time I’m at the store. I think I will make this with brown rice! I’ve never been a crazy pumpkin lover either- I do enjoy it, especially in oats/healthy baked dishes, but I’ll pass on the PSL! Brown rice would be delicious with this! I like throwing a couple spoonfuls into my oatmeal, but I’m just really getting into it this season. It’s got so many nutrition benefits too! Well done…………………………..Very very attractive and feel to hv now.. This was delicious! I doubled it and made enough for 2 dinners for me and my boyfriend, a lunch for me, and a scoop for each person (15 people) at a Friendsgiving party this week. Really satisfying. Will definitely make again! Maybe for my real Thanksgiving dinner! I had to add 3 tbsp of curry powder and 1 1\2 tsp to it. It was bland! Sorry about that Aneesa! I like to go a little easy on the spices because I know a lot of people don’t like all that heat. I hope you found something that worked for you! Agreed. I made a big batch but I find it super bland. What was the second spice you added (I think a word was missing) – did it help? I would add more curry powder and double all of the spices! Oh thanks so much for those tips! PS. I tried to rate the recipe, but it’s not letting me click! I give it four stars. SO happy you enjoyed it and were able to customize it to fit your tastebuds! And thank you for letting me know about the ratings. I’ll be making this very soon but going to swap out the pumpkin puree for chunks of roasted pumpkin. I know it will change the texture but I’m taking full responsibility as I have a Winter store of pumpkins. I will also be freezing 2/3 to see how that goes as well. Thanks for the recipe. I made this last night and it was Fantastic! I didn’t have Garbanzos on hand so I just used low-sodium white beans instead. I do not ever recommend using “light” coconut milk; always use full fat, no matter what, it truly makes a difference! Great use of pumpkin puree, it made the dish very smooth and hearty. I’m so glad you liked it! I bet white beans were just as delicious. Such a comforting meal! Delicious!!! I added a little more curry, because I like it very spicy. As you said, it was the perfect meal to fit my ”netflix evening” 😉 Thank you ! That sounds like a great night. 🙂 I’m so happy you liked it! Just wanted to give it a try at home, as I love cooking veggie but my parents don’t… And OMG, a total success!! We all loved how it turned, so delicious and full of flavour! Definetely will do it again! Thank you for sharing! the only thing i wish there was nutritional facts, so cal per serving. Hey! I do not calculate nutritional info for my recipes as I don’t count calories/macros, and everyone uses different ingredients. You can plug in your exact ingredients to https://www.caloriecount.com/cc/recipe_analysis.php to figure that out. Thanks! Your website keeps redirecting me to some kind of spam site. Sorry to say I think you have a virus attached to your site. Thank you for letting me know, Jacob!! I will be looking into that. Yay!! I hope you had an awesome Christmas, Kata! How did you like it? That’s awesome, Kata! So happy that you all loved it. Hi Emilie, I wanted to tell you how delicious this curry is…it is now simmering on the stove but I can’t stop tasting it. I’m making it in hopes to ward off a cold, but it will be going into the normal meal rotation. Thank you so much! Yay! I’m so happy you love this. I made it again for my parents recently and they loved it too. Thanks for the kind words, Jana! I am super excited to try this recipe tonight! This may be a silly question: do you think coconut cream would be an adequate substitute for coconut milk? Trying to use what I already have at home. 😬 Thanks in advance for your help! I’ve made this a couple of times for my family and we all love it. It’s so easy to make and incredibly tasty. In Australia (where I live) we don’t have canned pumpkin, so I just used regular cubed pumpkin in it’s place. I add it at the same time as the carrots. Thanks for the recipe. I want to commend you on the amazing recipes you have on this website. However, I also wanted to let you know that your site contains a lot of ads, which consistently crash my Firefox browser and I am using the latest version. I’m not sure if any other users experience this, but I wanted to bring this to your attention because you have a beautiful website. It makes it very difficult to stay on your website for very long because the ads freeze the browser and the ad videos load automatically, which prohibits me from scrolling anywhere else. Let me know if you have any questions about this. Just made this for dinner tonight, and it was quite yummy. I served it over quinoa. For the first servings I forgot the squeeze of lime, but gave it to everyone when they had their second helping. Delicious without the lime, but super awesome with it! The only change I made was to omit the cayenne since my daughter won’t eat anything even remotely spicy. Yay I’m so happy everyone loved this! I’m glad you were able to tweak it so your daughter would eat it. 🙂 Thanks, Mary Lynne! Hi, I made this last night and loved it!! I had almost all of the ingredients at home, just went out to buy the coconut milk and the cayenne pepper. I used fresh pumpkin cut in big chunks, then when it was almost done, I took the chunks out to smash them and put them back in the pot. I read some of the comments before cooking it and also ended up putting more curry and salt. I surprisingly easy and fast to make! Thanks! That sounds amazing! I’m so happy you loved it! I bet it’s absolutely delicious with fresh pumpkin. This is seriously the yummiest curry I’ve ever made! I do a lot of creative cooking as I’m vegan, and I made this last year & dehydrated it to take on a trip with me. I’ve cooked it for friends who all love it, and have just made another batch this morning. Even my toddler grandkids love it! Here in Australia we use fresh pumpkin and mash it (canned pumpkin puree isn’t a thing here) – pumpkin is under utilized in the states in my opinion. Anyway, looking forward to tasting my latest batch of this wonderful dish. Thanks so much for the recipe. YES I agree that we do not cook fresh pumpkin enough! You’re encouraging me to try my own once fall rolls around. 🙂 I’m so happy you loved this! Such a popular recipe! Hi! I have dried chickpeas. Should I soak the chickpeas overnight first? Great texture, straightforward to make. It’s bland af though, so literally double every spice you see. Thanks for the suggestion! I’ll test it out and adjust the recipe as needed. I can’t believe I’ve never thought of this combo before! I’ll definitely be making these this weekend – I love finding new ways to use pumpkin! Hi, I made this yummy recipe and served it with quinoa ! my daughter loved it , it’s a real comfort food! So so good! I didn’t have chickpeas at the moment so I added tofu instead. Also, since I love sweet and savory meals, I added about a tablespoon of honey. Anywho loves this resipe. Thank you so much! So happy you enjoyed it, Courtney! Both of them sound good! This was amazing! I added a little more heat and served it over quinoa. Delicious! Thank you for sharing. Sounds so tasty Missy, thank you for testing it out! This is a keeper! I am not well versed in curries so I appreciate that this was an easy and fantastic recipe to follow. I did up the spices to 1.5 times the amount. Serving over rice for dinner tonight. Thank you so much! I made this dish this past weekend and it was DELICIOUS! I want to make it again this coming weekend and am wondering if it would taste good with sweet potatoes? I am pretty novice in the kitchen so I’m not sure when I would add the sweet potatoes in…if this is something that would even taste good in the curry! I think it would definitely fit here! I would chop it into small pieces and add it with the coconut milk; simmer until the potatoes and carrots are tender. Add more water if needed! Hi! I’m really looking forward to making this recipe but of course I forgot to buy tomatoes when I went to the store today! THe only tomato I have is pure tomato sauce, so you think I could just use that? Tomato sauce would likely make the curry a little too watery. You can try to omit the tomato if needed, or use 1 TBS tomato paste for depth of flavor. Good luck! Loved it. Family enjoyed it. Had with quinoa, which adults liked but my 11 year old wasn’t a fan. Will make with rice next time. Thank you for the great recipe! Could this recipe be made in a crockpot!? I have not tried that, but let me know if you do. I would guess that you would need more liquid (water or broth). Can I use a can of diced tomatoes or do they need to be fresh? Yay! Glad it worked for you, Abby! I love Italian food and this is delicious dish. Thanks for sharing.